…insane amounts of flavor in an insanely short amount of time. Preheat your oven to 350 F. To make your life easier, line a 9 inch cheesecake tin with foil, and lightly grease the foil with butter or oil. Then crush the cookies in a food processor, because that’s the easiest way for me, and mix in the melted butter until each and every crumb is coated. 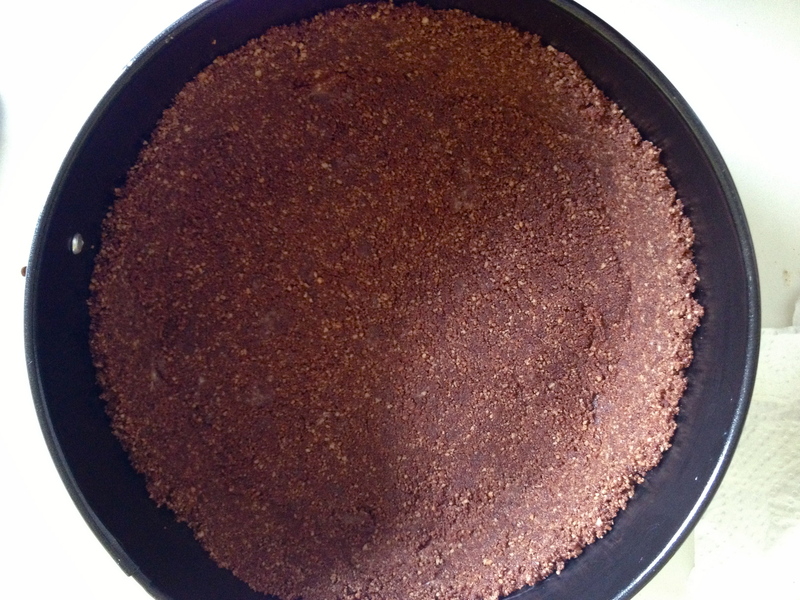 Press the crumbs into the base, covering the bottom then working the extra crumbs an inch up the sides. 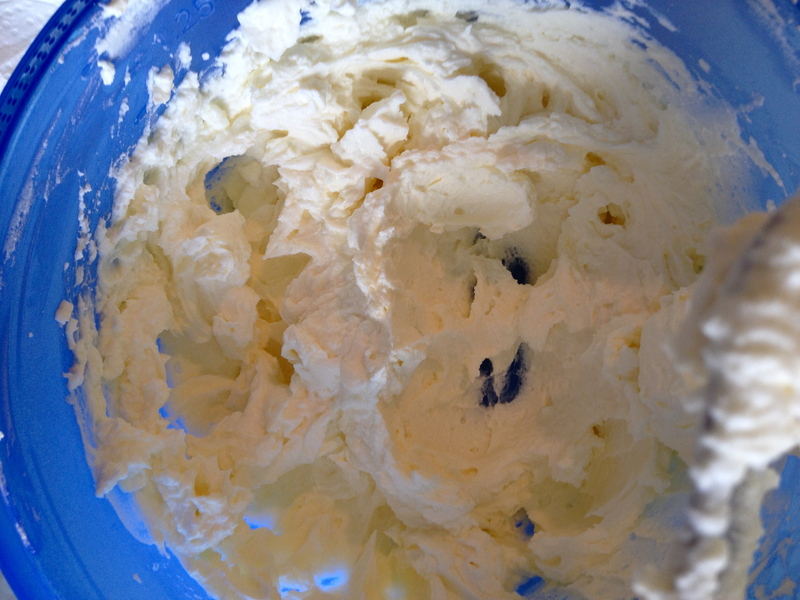 Whisk the cream cheese and sugar until you have a smooth mixture. 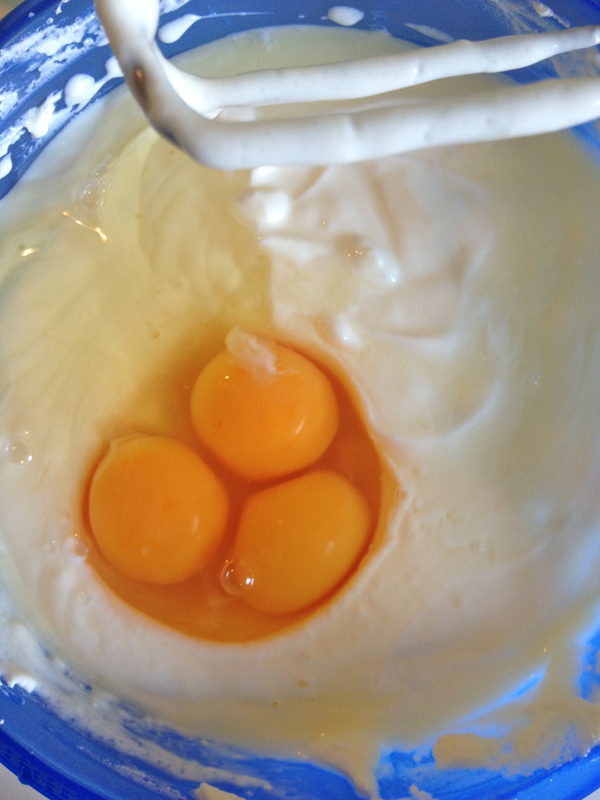 Then beat in the eggs, one at a time, and finish off with the sour cream and vanilla. That’s all! Pour the mix into the prepared crust and bake for about 40 minutes, or until the cake seems to be set except for the center, which should wobble a little when you move the tin. At that point turn off the oven and leave the cheesecake in for an hour. Then take it out, let it cool completely and refrigerate it for at least 3 hours before devouring it. You can add anything to the basic mixture, or just top it off with some fruit, chocolate sauce, peanut butter, or layer this with a cake, and it’ll be delicious every time! Party Dip & Jalapeño Popper Turnovers! It’s Thanksgiving tomorrow, and I don’t know what i’m more upset about; the fact that it’s not a big event here in Ilmenau, or that i’m missing out on Black Friday sales again. But i’ll tell you all this. I’m still going to celebrate. I may not bring home a turkey and stuff it with whatever it’s supposed to be stuffed with (I could never cook a whole bird. They look like they can pop up and run away any second) and I may not make cranberry sauce and gravy, but there will be mashed potatoes on my table, and just to make up for the missing turkey, i’ll make some other things that can totally be the life of the party. I know Thanksgivings are a family affair, with sit down dinners and endless platters of food, so here are a couple of recipes that can be made in bulk, in advance, cooked quickly, and ultimately get you through the day up till dinner without draining all the energy out of you. But you can’t get away with just making these. YOU still have to make the turkey. For me. I’m sure you might have come across this recipe, but I just have to post it just in case some of you haven’t. This recipe needs to be in everyone’s life. And the best part is it’s a dip, and it doesn’t have to be cooked; just made in advance so it can be chilled. The only thing you have to keep in mind here is that the salsa you use should be delicious! Start off by whisking the cream cheese till it’s smooth and fluffy, then mix in the sour cream and salsa. 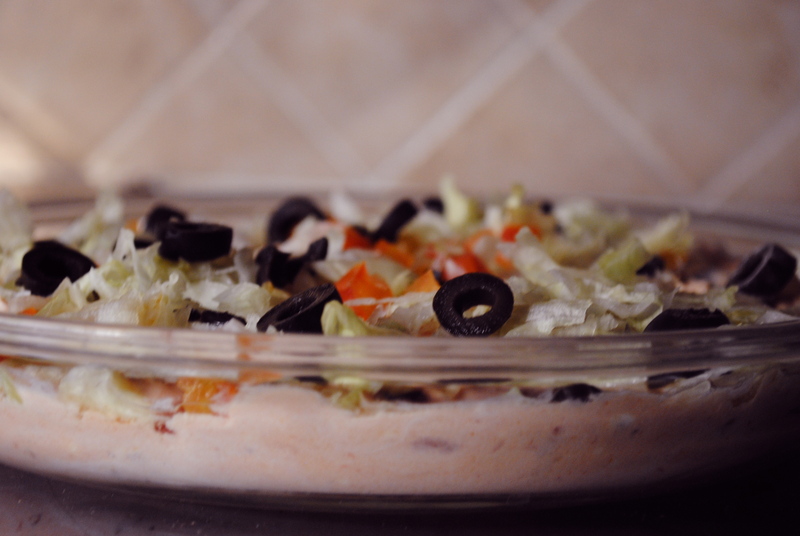 In a dip bowl pour half of the salsa mix and top off with half of the lettuce and cheese. Then pour over the rest of the salsa mix and sprinkle over the remaining lettuce, the olive and tomatoes and the rest of the cheese. Just a tip: the lettuce has to be shredded very finely, or the dip will turn into a extremely unhealthy salad! Chill this for at least 3 hours, but over night is perfect. Serve with cool ranch Doritos if they’re available in your area, or just plain tortilla chips and potato chips will do. You can obviously add more or less of any of the toppings (tomatoes, olives, lettuce, cheese) but keep the cream cheese, sour cream and salsa just as it’s listed. This is enough for a medium sized party, but if your family accounts for half of the city’s population you might want to make an extra batch or two. These are delicious. They’re a little different from the normal jalapeño poppers, but they taste great! Since you’re making these for a party, make them small. You can be creative with the shapes, but when it comes to bulk food, uniformity is the way to go. So choose one shape and stick to it! 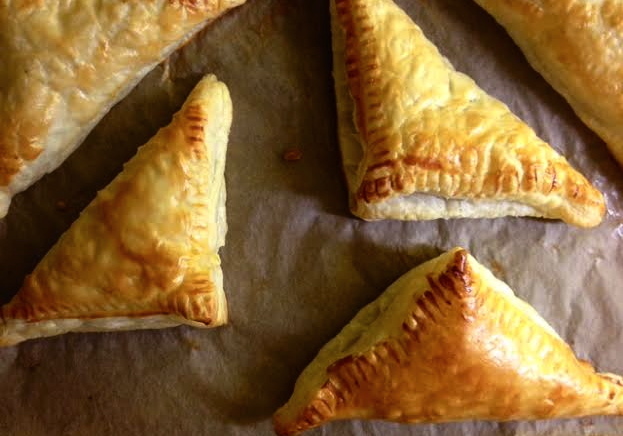 I usually just cut the puff pastry into little squares (because it’s easy) and then fold them over once filled to make cute little triangular pouches of cheesy heaven. Divide the ingredients appropriately between each square. For 2-inch squares: Spread 1 tsp cream cheese, keeping a little inside the edges. Then place once jalapeño slice towards a side and top off with a 1 t shredded cheddar. To close just fold opposite corners. Seal with a fork. That ensures the pastry sticks together and also makes the poppers look pretty. You can make these in advance as well. They can be frozen or you can make them a day before and keep them in the fridge till they’re ready to be baked. Before baking preheat your oven to 200 C and brush each popper with the egg wash. They’ll bake in 8-10 minutes and puff up beautifully. If you bake them out of the freezer you might need to add a couple of minutes to the baking time. But you’ll know they’re cooked when they’re golden brown. Yup folks, it’s true. 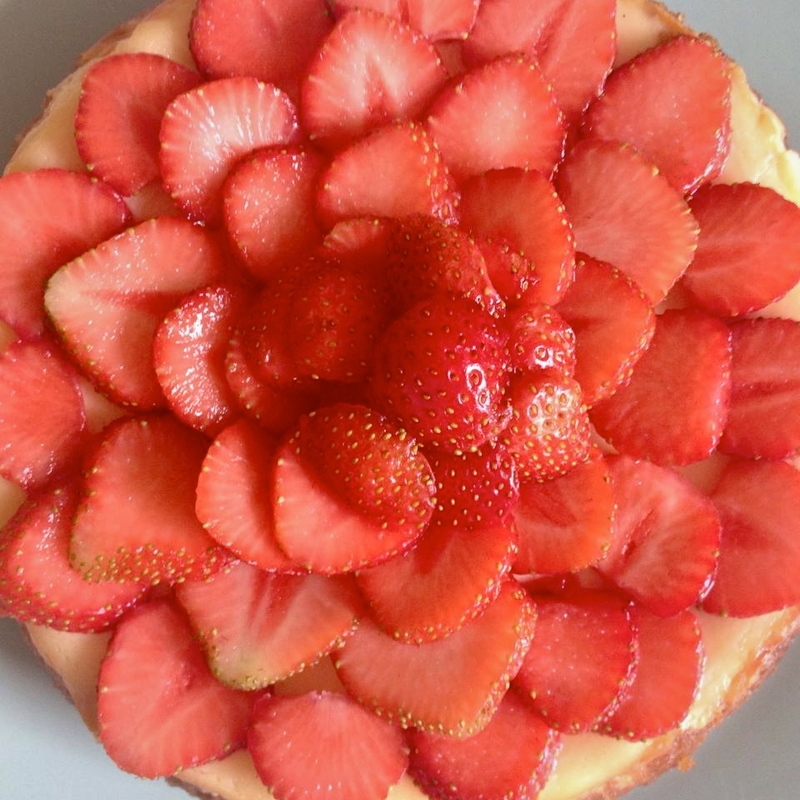 This cheesecake is as light as a feather, if not lighter. 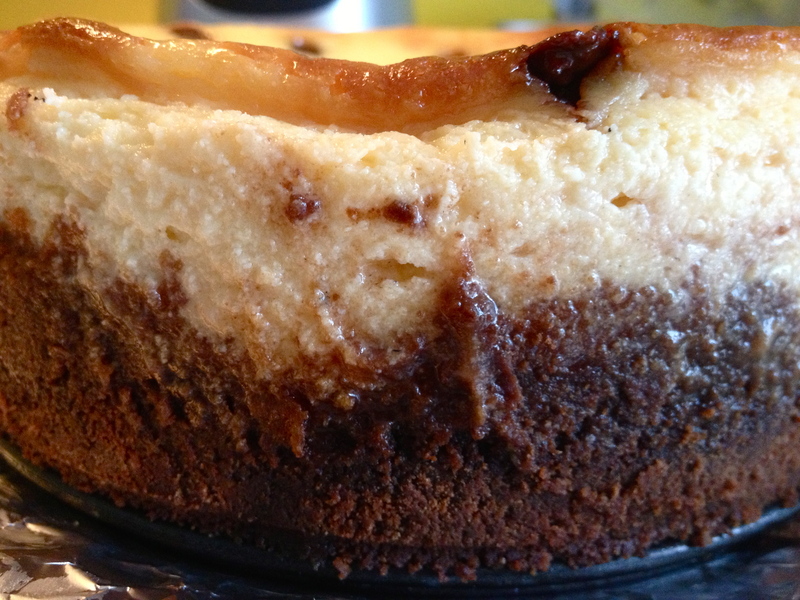 I’ve made about five different cheesecakes, and after making this one i’m never going back to any other! You can change up the add ons in this and make it into any flavor you want, but keep the basic recipe the same! I added chocolate chips to this one, because i’m very excited about the 10 pounds of TollHouse chocolate chips I brought back from my trip to Detroit! But sadly, every time I use these chocolate chips, which will be for a while, the annoying experience of traveling haunts me! Ever since i’ve moved to Germany i’ve been traveling a lot, and every time I do, I get to experience the infamous ‘random’ special screening. It’s actually pretty amusing now, because i’m so used to it, and seeing everyone’s expression when they scan my passport and the light turns red is even more amusing! And considering I get stared at enough because I wear a head scarf, the beeping red lights and the half hour spent ruining my meticulously packed hand bag is just icing on the cake! But this time it was pretty hilarious because all I had in my hand bag were five huge bags of chocolate chips, a few cookbooks and a few bags of candy. Oh and also my camera, which was filled with pictures of food! You’d think they’d stop checking me now because all they find is chocolate and cookbooks, but noooo! Ok enough of my airport rants! 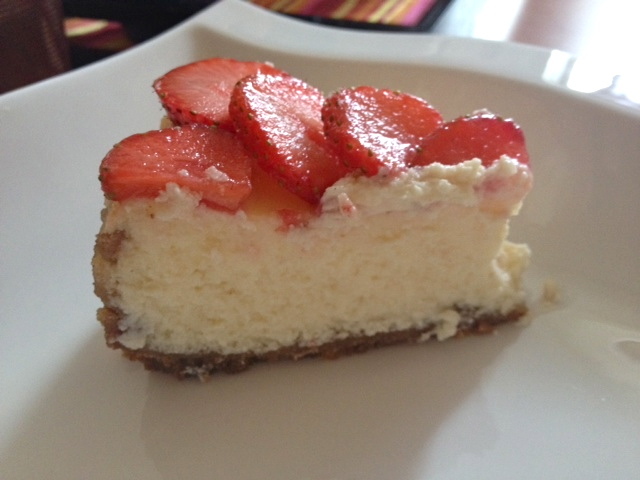 Let’s get back to this amazing cheesecake, whose recipe I adapted from the Mrs. Fields cookbook. There’s not a lot of ingredients, and even the baking time isn’t that bad. The only hard part is waiting for it be chilled through, which takes about three hours. Preheat your oven to 350 F. Crush the cookies, butter and cocoa powder in a food processor and press them into a greased 9×9 inch cheesecake pan. 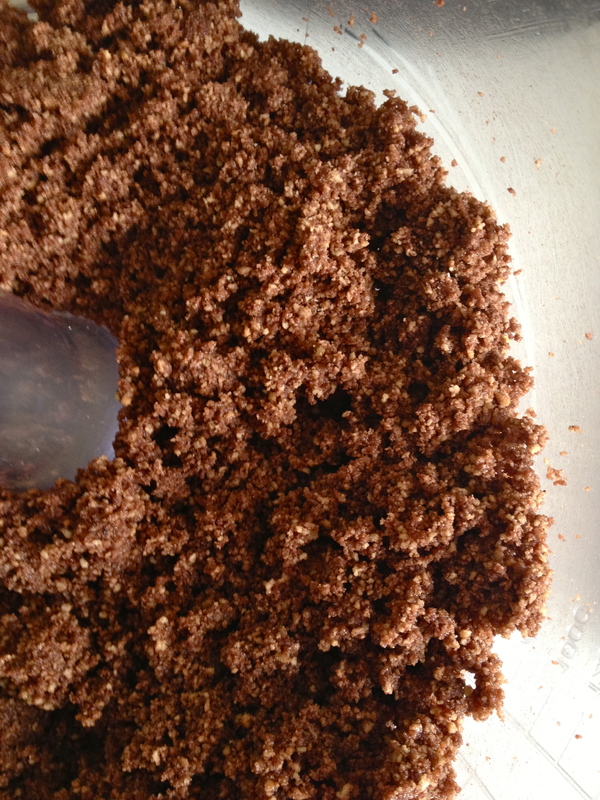 Just a quick tip for the crust: press the crumbs up the side first, then press the remaining into the base. Refrigerate till the filling is ready. 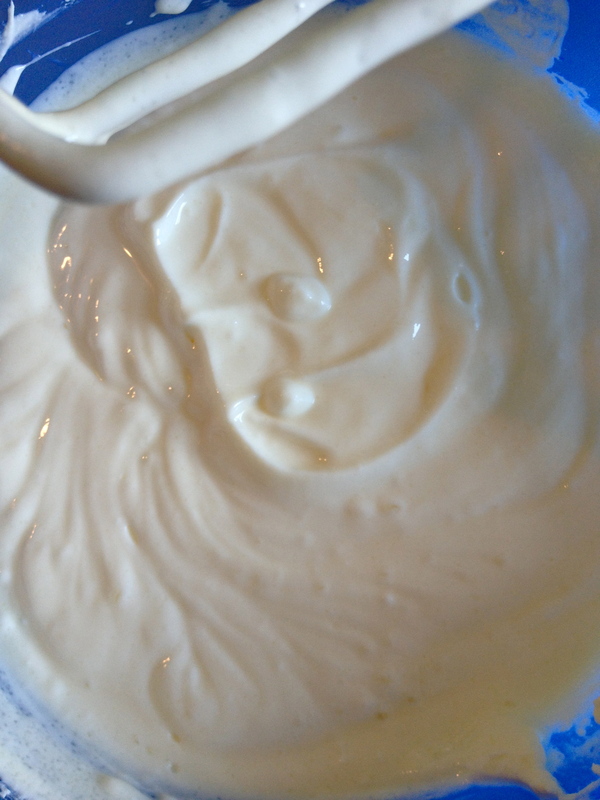 In a large bowl whip the cream cheese until it’s smooth, then mix in the sugar and sour cream. Since there’s a lot of sour cream in this, you can add up to 1/4 cup more sugar if you want it to be sweeter. 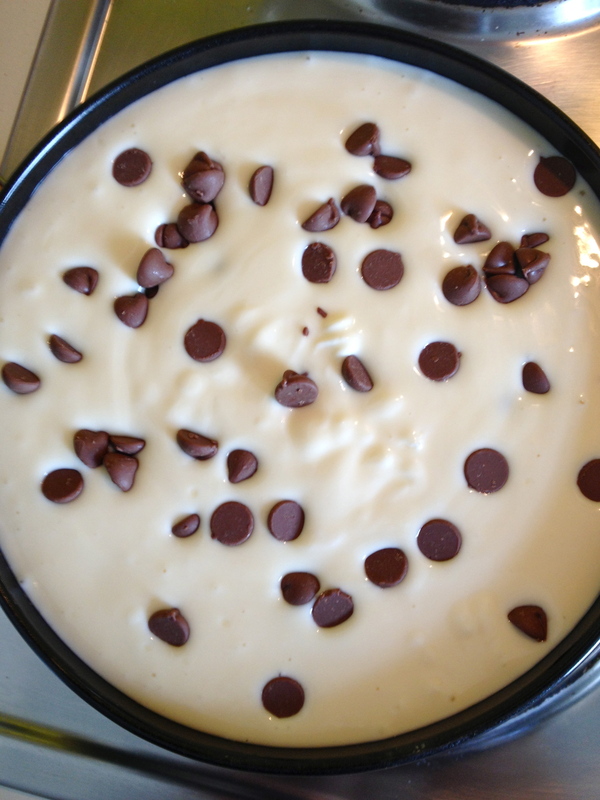 Next, add in the eggs, vanilla and 1 cup of the chocolate chips. 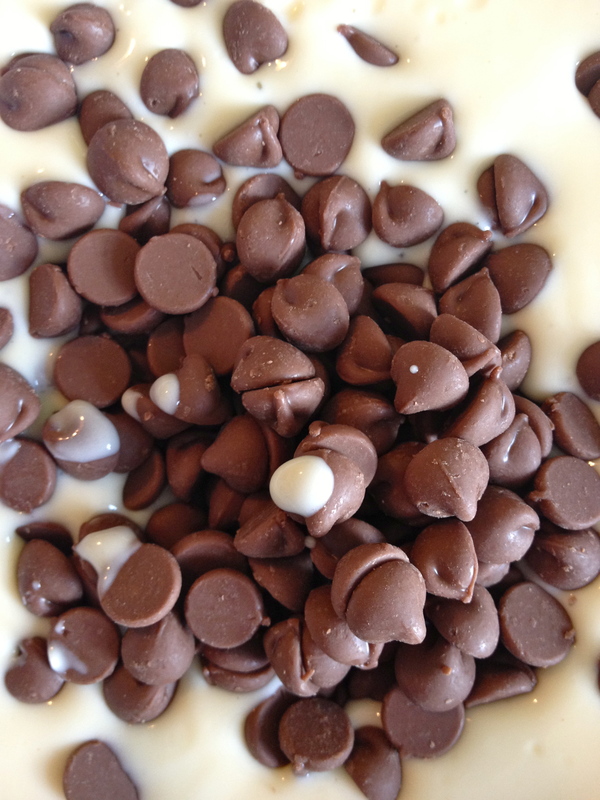 Pour the filling into the crust and sprinkle over the remaining chocolate chips. 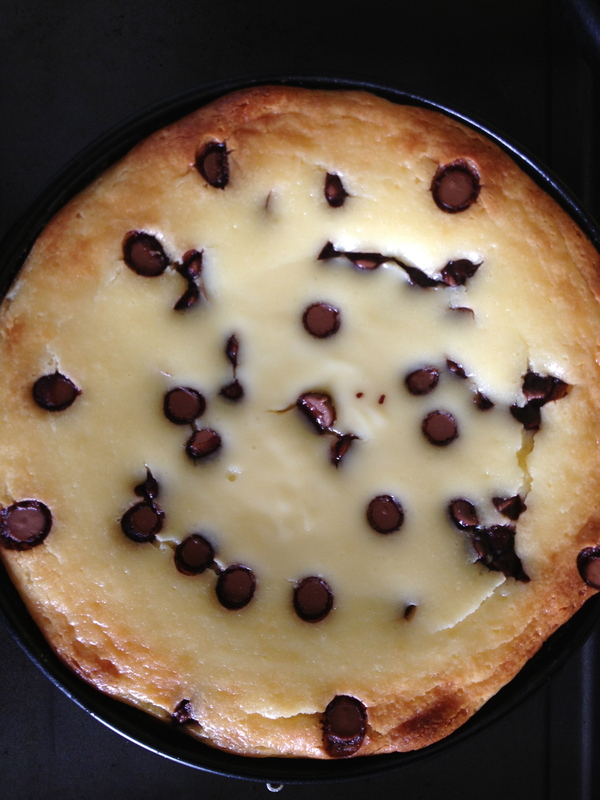 Bake the cheesecake for 35 minutes and then turn off the oven but leave the cheesecake in so it can set. 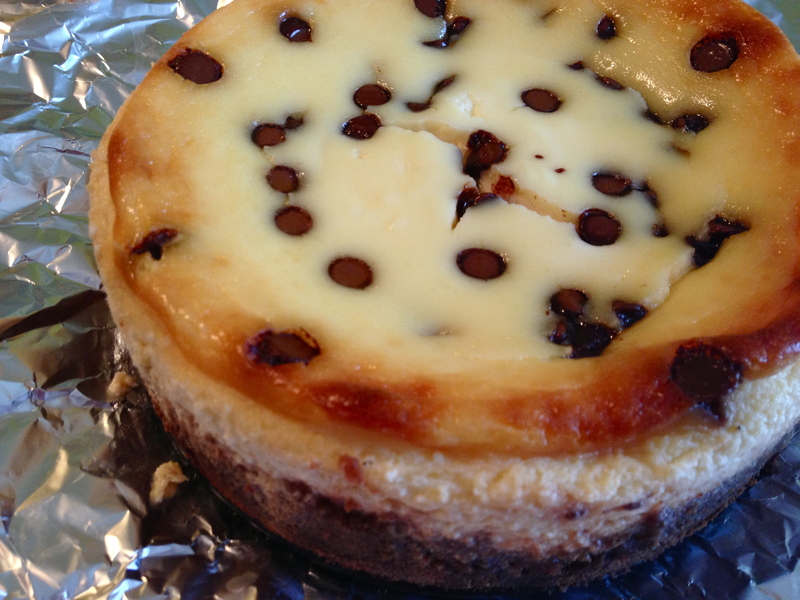 Once you turn the oven off, leave the cheesecake in until the oven has cooled down. 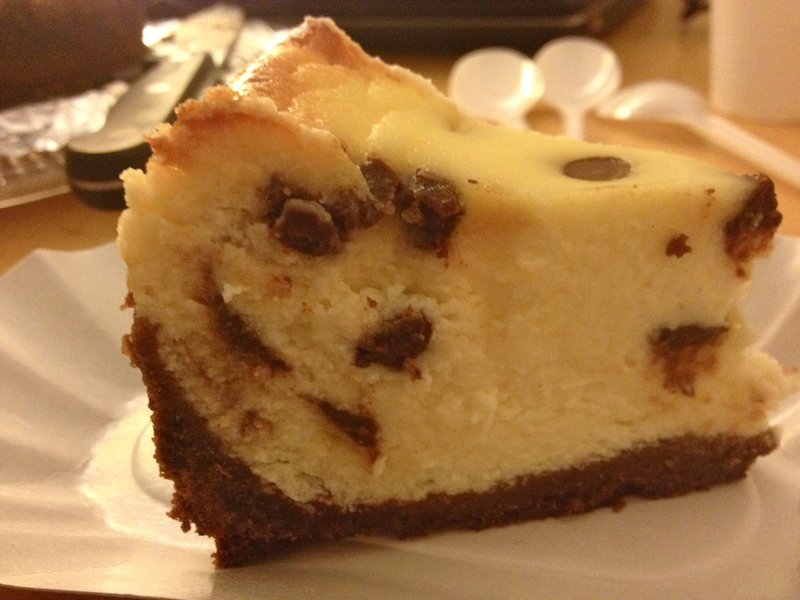 At this point don’t take the cheesecake out of the pan. Just put it in your fridge for about four hours minimum. A whole day or over night would be much better! I made it in the morning and we ate it at night. And since this has no flour or added rising agent besides the eggs, it is extremely light and fluffy. It’s texture is a lot like a soufflé actually, and it’s delicious!